FORT BRAGG — I laugh at our vocal locals who love to gripe about California. At the same time they are yapping about the “People’s Republic of California,” their kids wind up choosing places such as “Slo Cal” — not West Lafayette, IN, or Columbus, OH —to go to college. And then there’s the retirees who knock the state but happily hop in their RVs for a road-trip to the redwoods. Go figure! LOL. 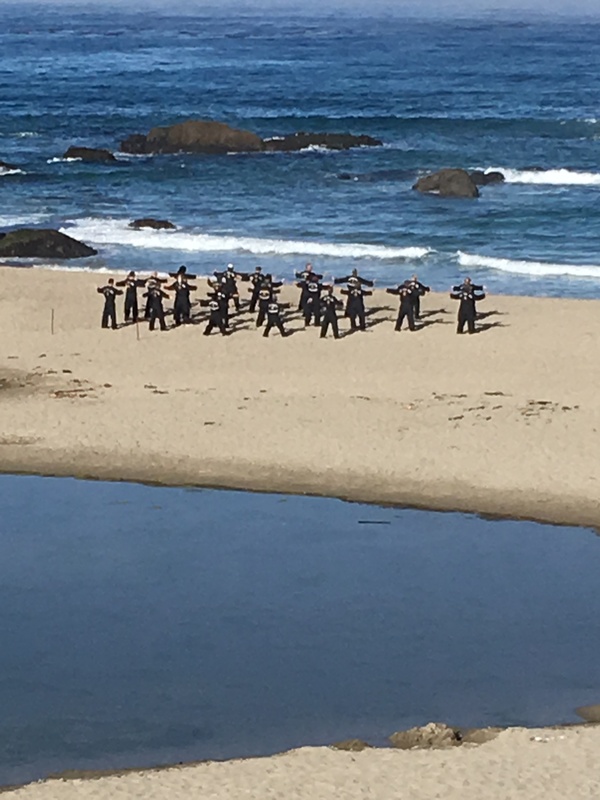 We’re in scenic Fort Bragg this weekend where our son Mitchell is joining his fellow black belts from Gold Country Kuk Sool Won of Nevada City for a “destination” training session at Pudding Creek Beach. We brought our lab Whiskey along to run on the beach, chew on driftwood, and chase seagulls. We arrived Friday night on the “road less traveled,” all on Highway 20. It’s a four-hour drive to the Coast, past Marysville and Yuba City; hillsides studded with oak trees; Clear Lake; a dinner stop at the Broiler Steak House (think the Willo); the logging town of Willits; and the last stretch — a road surrounded by towering redwoods that pops out at Fort Bragg. It’s a beautiful stretch of Northern California. We’re staying at the Beachcomber Motel, just north of town. Our room has a dead-on view of the Pacific and a sliding door that opens onto a deck, with a path down to the beach. It also has a hot tub for soaking , a perk I figured our son would appreciate after his workouts. This morning, we took our dog for a walk to the beach and sat on the deck with our coffee, watching the fishing boats head out to sea. The afternoon we’ll drive into town for fresh seafood. I already know we’ll be back. Owner Tony Reyna, a sixth-degree black belt, and his spouse, Lila, a fourth-degree black belt, are leading this “excellent adventure.” I’m a big fan of both: Their family run business in the Seven Hills Business District is now in its 25th year. Lila also teaches a self-defense program with emphasis on women empowerment and is the author of a book Quiet Mind, Warrior Spirit. The Reyna’s operate a quintessential western Nevada County small business — the lifeblood of our local economy. Our son has been going to Gold Country Kuk Sool Won since kindergarten, when he joined as a “Turtle Tot,” a fun introduction to martial arts training. He has worked his way up to black belt. Now, at 16, he’s training for his second-degree black belt. Tony is a super mentor. His mantra: Etiquette, patience, self-discipline, and perseverance achieved through martial arts training helps the students in their daily lives. Gold Country Kuk Sool Won also has organized trips to South Korea for its students. This April, we are visiting Beijing and South Korea, and Tony is going to arrange some training for our son in Busan, a port city known for its beaches, mountains and temples. It’s going to be an immersive cultural experience.